Yuzu Marmalade: Mix the yuzu rind, yuzu juice, sugar, honey and water, then bring to a boil and reduce to a syrup with a sticky and dry consistency. Pickled Ginger: Soak the young ginger slices in rice vinegar. Sauce: Combine the charred leek slices, soy sauce, sake and coconut sugar in a pot and simmer for 5 minutes. Scallion Oil: Combine the off cuts of scallion / long bunching onion in a sauce pot and bring to a boil. Simmer till the onions and garlic are browned, then strain. 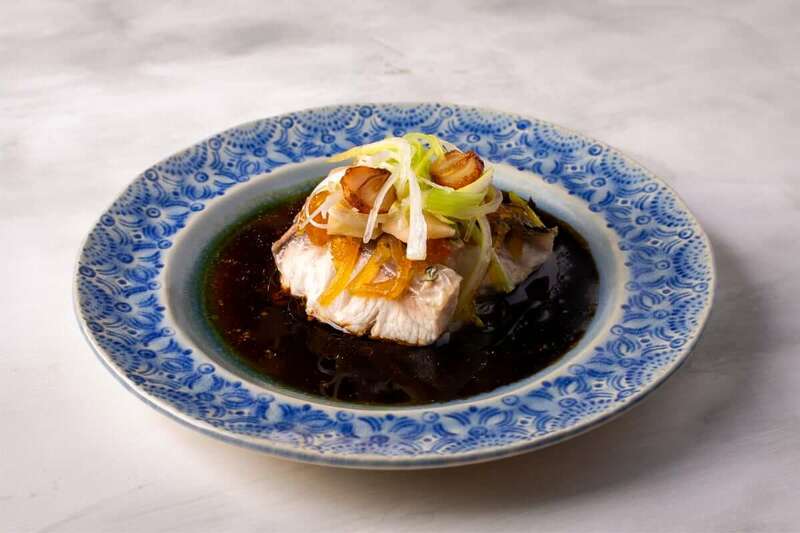 Steamed Fish: Place the leeks on the bottom of a steaming tray, lay the Barramundi slices on top, then top with pickled ginger slices and yuzu, drizzle sesame oil and steam the tray on high heat for 5 — 6 minutes till the Barramundi is just cooked through. Drain some of the liquid into the sauce and reduce, then adjust to taste. Top the fish with julienne onion and pour the hot scallion oil over everything. The oil should be sufficiently hot to sizzle the onions. Pour the sauce around the Barramundi slices and serve.